We know that art has the power to heal—improving mental health, physical health, and contributing to higher quality of life. 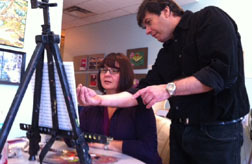 Caring Arts Foundation creates and facilitates programs with this focus at our core. We partner with area hospitals, cancer treatment centers, and similar facilities who share our mission. ﻿Our acclaimed Caring Arts program unites professional artists from the community with local cancer treatment centers, as a way to provide cancer patients and caregivers guidance in finding their own expressive voice through an art form. The focus is on the act of expression rather than the outcome. Our artists are high caliber professionals from a variety of creative disciplines. We partner with some of the most esteemed hospitals and cancer facilities in Chicago and, through our outreach, connect with thousands of patients and families annually. ﻿Music can heal the mind, body and spirit. Our professional musicians transform hospital spaces into concert venues, engaging both patients and staff in the therapy of music. ﻿Our artists make meaningful connections with the families they encounter, providing an emotional outlet for them through fine arts, crafts, journalling and more. Our professional photographers take photo portraits of cancer patients and their siblings at Lurie Children’s Hospital, providing wardrobe, props and enthusiasm! A common area in the hospital is transformed into a studio, which, in addition to lighting and backdrops, includes props and dress-up outfits for the children and teens. Parents are provided with a full set of photos of their child at no cost — a priceless keepsake. 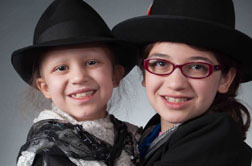 These photo sessions give patients and their families a break from cancer treatment while providing lasting memories. 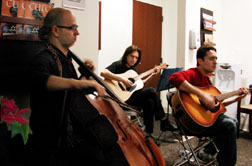 Bill Syniar (guitar) & Petar Kecenovici (cello) performing on the inpatient unit at University of Chicago’s Center for Care & Discovery. The Duo performs regularly for cancer patients at hospitals in the Chicago area on behalf of the Caring Arts Foundation.